Too little is known about pre-Roman Europe, because they left no texts, but they ‘designed landscapes’ through forest clearance, the layout of settlements and the formation of religious sites with significant locations in the landscape. Neolithic (Celtic) enclosures stood on the land which became London but it was the Romans who built the first city, after they invaded Britain in 43AD. The site was chosen as the lowest bridging point on the Thames. The walled Roman city had classic examples of landscape architecture: a private garden, which belonged to the governor and was on the site of what is now Canon Street Station, and a forum, used as a market and for social gatherings of all kinds. Leadenhall Market was built on the site of London’s Forum. London spread west after the Roman’s left Britain and by 1066 Westminster had a royal palace and a monastery. William the Conqueror was crowned here, lived here and hunted deer in the surrounding woods. He owned the whole of England and enacted forest laws to protect large areas of land for hunting. William conserved game animals for his own use and punished poachers. Though described as ‘forests’ much of the land was open. By Tudor times the land in royal ownership was restricted by boundaries. Henry VIII was a keen huntsman and acquired large tracts of land beyond Westminster. This is the land which became Central London’s Royal Parks: St James’s Park, Green Park, Hyde Park and Kensington Gardens. The land was progressively opened to public use in the centuries after his death. London has much to thank Henry VIII for. He loved gardens and had the habit of building a new palace and garden when he took a new wife. Something of his renaissance garden survives at Hampton Court Palace. When the renaissance came to affect urban design, in the seventeenth century, London began to make urban squares, following examples in Italy and France. In Italy, squares were used for markets. In London, they became garden squares. Many survive and give the West End its graceful character and charm, notably in Mayfair and Belgravia. The public park, defined as a greenspace in public ownership and designed for recreational use by everyone, was a nineteenth century idea. Victoria Park was the first. Battersea Park, Southwark Park and Finsbury Park are notable examples. They were laid out in the Gardenesque Style and regenerated by landscape architects in the 20th century. Greenways were the most important new open space type in the last century. Historically, the idea derives from baroque avenues used by huntsmen in the country and by horse-drawn carriages in towns. As with use of the Thames by royal barges, the aim was to create a route for a pleasurable journey. Patrick Abercrombie was a great greenway planner. His 1943-4 County of London Plan aimed to make it ‘possible for the town dweller to get from doorstep to open country through an easy flow of open space from garden to park, from park to parkway, from parkway to green wedge and from green wedge to Green Belt’. This remains a central objective for the landscape architecture profession. We need to a modern London which is a world capital for outdoor recreation and sustainable green transport. 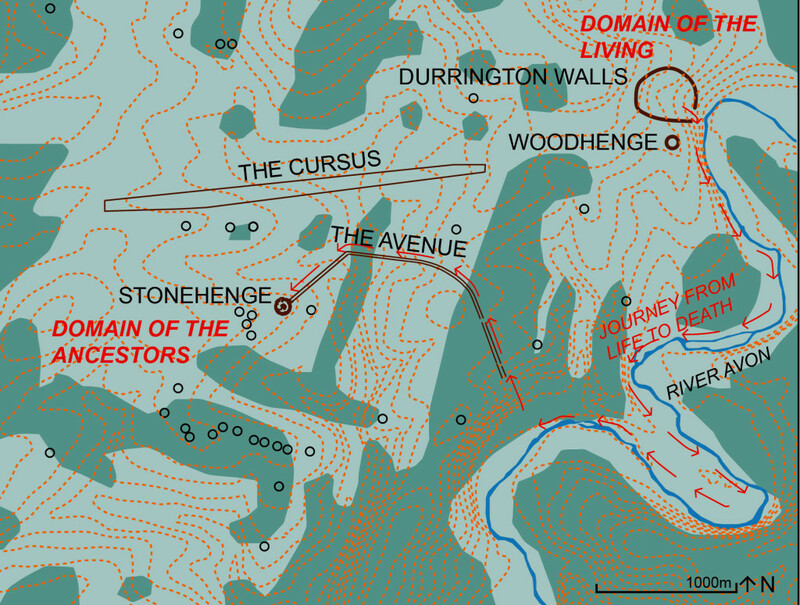 Stonehenge shown with what is believed to be its ancient treecover pattern. It was a ceremonial landscape with two settlements, two routes and an enclosure with spiritual significance. Its use is now thought to compare with that of the first great western example of landscape architecture: the Domain of Amun, in Egypt. As at Thebes, the people of Stonehenge processed from the Domain of the Living to the Domain of the Ancestors.